Providing some data and insights into comparisons between 2014 Edition and 2011 Edition certification numbers. When ONC published the 2011 Edition final rule it included a definition for “Certified EHR Technology” that required eligible professionals (EPs), eligible hospitals (EHs), and critical access hospitals (CAHs) to have EHR technology certified to all of the certification criteria adopted for an applicable setting (ambulatory or inpatient). Gave EHR technology developers greater incentive (beyond a marketing distinction) to seek “Complete EHR” certifications for their products. In response to this feedback, we fundamentally changed the “Certified EHR Technology” definition in the 2014 Edition final rule. An EP, EH, or CAH now needs only the EHR technology (certified to the 2014 Edition) to satisfy their stage of MU – and no more. For example, an EP who needs to achieve MU Stage 1 does not necessarily need EHR technology certified to do secure messaging (an MU Stage 2 objective)). A “Complete EHR” is no longer needed to meet the Certified EHR Technology definition and demonstrate MU. And, based on our policy change, there is no longer a regulatory advantage for EHR vendors to seek Complete EHR certifications. In fact, the policy change strongly encourages the opposite result – smaller scoped, more specific, certified EHR Modules that can be combined together to more closely align the certified capabilities needed by an EP, EH, or CAH to demonstrate MU. Going forward, it’s now more important to look at what an EHR technology is certified to do in contrast to whether it’s been issued a “Complete EHR” or “EHR Module” certification. For clarity purposes, I’ve divided this section into a question and answer format. With questions #1 through #3, I hope to better explain how we look at the CHPL data and focus on a few 2011 Edition points. With question #4, I discuss one of the metrics we’re monitoring to assess EHR vendor progress toward 2014 Edition certification. Question 1: What is the CHPL? The CHPL lists every EHR technology (and subsequent versions of that same product) certified under the Temporary Certification Program by an ONC-Authorized Testing and Certification Body (ONC-ATCB) and under the ONC HIT Certification Program by an ONC-Authorized Certification Body (ONC-ACB). As a result, drawing conclusions from the cumulative raw numbers on the CHPL significantly overestimates the actual number of unique products (and does not account for products used for MU attestation). Before I dive in, I want to note that the data for questions #2 and #3 are based on MU attestation data through July 31, 2013 and CHPL data through August 8, 2013). Question 2: How many Complete EHR and EHR Module vendors have had at least one EP, EH, or CAH attest to MU using their 2011 Edition EHR product? Ambulatory setting answer = 59%. Of the 861 ambulatory EHR vendors with a either a Complete EHR or EHR Module product listed on the CHPL, 507 have had a product used and reported to CMS as part of an MU attestation. Inpatient setting answer = 51%. Of the 277 inpatient EHR vendors with a either a Complete EHR or EHR Module product listed on the CHPL, 140 have had a product used and reported to CMS as part of an MU attestation. This data conveys two points. First, on a positive note, the ambulatory and inpatient EHR markets have seen an impressive number of different EHR vendor products used to demonstrate MU. Second, the data suggests that it is likely we’ll see a sizable reduction in the number of EHR vendors listed for 2014 Edition certification since close to half of the 2011 Edition EHR vendors (and their products) listed on the CHPL have never been used for a single MU attestation. Recently, a lot of attention has been paid to the number of “Complete EHRs” listed on the CHPL. Due to this interest, I thought it would be helpful to dig a little deeper into numbers to explain a few points. 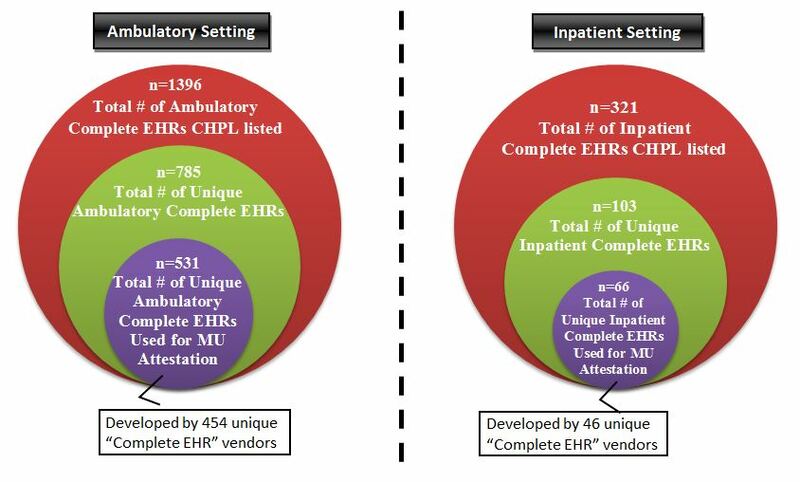 The following images illustrate the relationship between the number of 2011 Edition (ambulatory and inpatient) Complete EHRs listed on the CHPL (red circle) and the number of those Complete EHRs that are “unique” products (green circle). It also shows (purple circle) how many of those unique products have been used for MU attestation. We determine “uniqueness” by the assigned certification number. For example, if “Product A1” is listed on the CHPL and then “Product A1.1” lists on the CHPL two months later retaining the same assigned certification number then we view those two EHR technologies as the same (typically updated) product and not a “unique” product entry. Question 4: What progress has been made toward 2014 Edition certification? I know, I know, I saved the most important question for last. As a whole, our combined CHPL/MU data analysis indicates that approximately 2 out of 3 previously attesting EPs, EHs, and CAHs have a 2014 Edition certified product available from their “primary 2011 Edition EHR vendor,” with many of those products meeting or exceeding the number of certified capabilities necessary to satisfy the Base EHR definition. While we are not yet at the 100% we want to see for both settings, this progress is encouraging and we’ll continue to monitor and update this metric over the next few months. We recognize that much work still remains for all stakeholders as the shift to 2014 Edition EHR technology occurs and acknowledge that our data on the availability of certified 2014 Edition products does not account for local implementation schedules and training needs. That said, we believe the policy change to the Certified EHR Technology definition and the special one-calendar-quarter reporting period in 2014 for all EPs, EHs, and CAHs (who are in their 2nd MU participation year or higher) will help ease the transition. For those of you who want a more detailed breakdown, here’s how we got to the statistic above. Based on the data that we can crunch, one of the best metrics we have available is to identify the percentage of EPs, EHs, and CAHs who attested to MU using a “primary 2011 Edition EHR vendor” who also has a 2014 Edition product on the CHPL that has been certified to the certification criteria necessary to satisfy the Base EHR definition (a foundational set of 20 certification criteria to which all providers need EHR technology certified). We can also identify the total availability of 2014 Edition products by “primary 2011 Edition EHR vendors” in the cases where they have not yet certified products that meet the Base EHR definition. This analysis accounts for an EHR vendor’s share of MU attestations. It also approximates how many EPs, EHs, and CAHs that previously attested to MU have a 2014 Edition product available to them by their primary 2011 Edition EHR vendor. Note, this data (compared to the data used for questions #2 and #3) is MU attestation data through July 31, 2013 and CHPL data through August 28, 2013. Step 1: We identify an EP’s, EH’s, and CAH’s “primary 2011 Edition EHR vendor” (defined by the EHR vendor’s product that’s been certified to the most 2011 Edition certification criteria and submitted by the EP, EH, or CAH for MU attestation). Step 2: We look at the percentage of EPs, EH, and CAHs that previously attested whose primary 2011 Edition EHR vendor also has a 2014 Edition product listed on the CHPL that satisfies the Base EHR definition or has at least one 2014 Edition product listed. 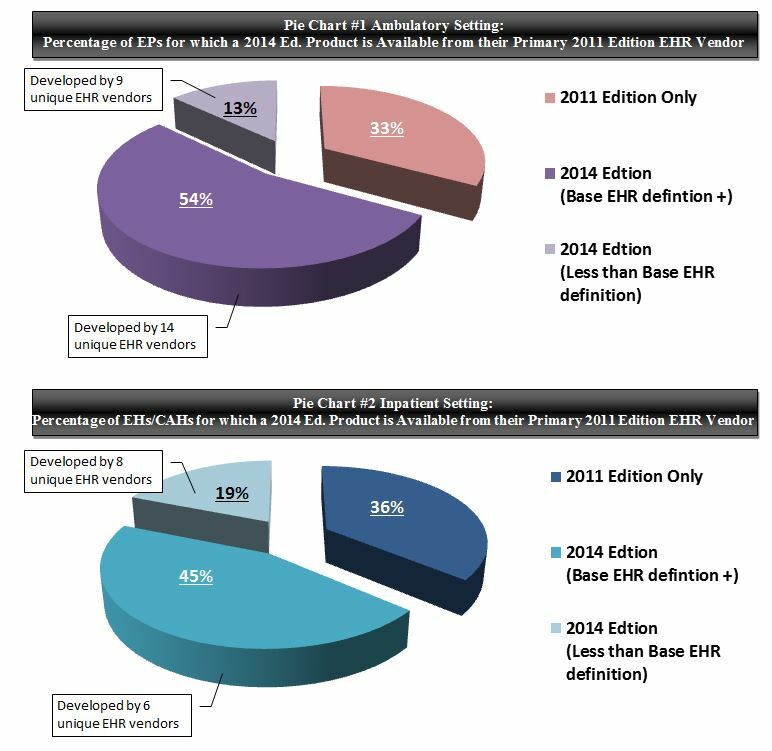 54% of EPs have 2014 Edition EHR technology available to them from their primary 2011 Edition EHR vendor, with another 13% of EPs who have a primary 2011 Edition EHR vendor with at least one certified 2014 Edition product (and who is presumably “on track” toward providing suitable 2014 Edition solutions). [Pie Chart #1].